I feel motivated now to write them about all the mistakes in my ThruLines. Thanks! Kitty, if we keep giving feedback I’m sure it will help to improve ThruLines. Thank you, Brian. I’ve already found a few cousins who descend from my William A. W. Dempsey who I hadn’t yet figured out! This week my ThruLines disappeared my mother and all her relations! 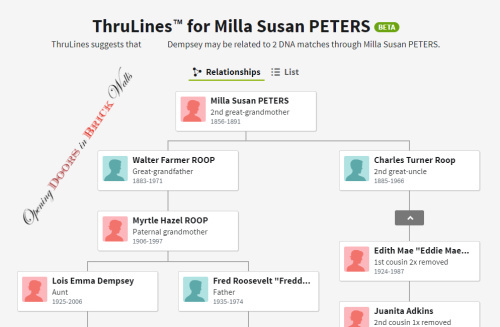 I switched linked trees to one focusing on my father recently to chase a lead, and when I changed back to my mother’s tree, ThruLines is stuck on my Dad’s and his family. It hasn’t changed in days, despite my efforts to get it to recognize my Mom’s tree again. I have written feedback, so we’ll see what happens! Has this happened to you?? I had a public ancestors only tree linked to the DNA. I switched to my complete tree and made it private. I had to upload it to Ancestry as I don’t work on the site. It took a week for it to be switched. I think once they are recognized and were in the system they can be switched within 48 hours as they write in their blog. However, if it is a new tree, in my case at least, the waiting period was LONG. Switching back and forth only slows it down, in my opinion. Great job! I have suspended my Ancestry account for a while, so I can’t check on mine to let you know. Maybe they will get all the bugs worked out before I can try it. Thank you, Laura. Sorry for being so slow replying. “Access to ThruLines™ Beta is available to customers without an Ancestry subscription for a limited time.” If you have your tree linked to your DNA test then you are able to view the ThruLines at this time. My 3rd great grandmother’s 2nd husbands wife’s parents are no longer in thrulines. But hardly anyone else is either. And that little blue icon thing is now gone completely. I didn’t know what it was for so I went back to see and it’s not available at all. But I don’t care. The whole feature is worthless to me. Toni, only direct ancestors are used in the ThruLines. 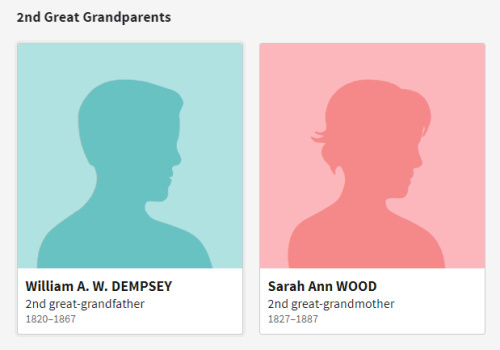 If your 3rd great-grandmother’s 2nd husband was not your 3rd great-grandfather then this is why his parents aren’t included. As for the icon, did you perhaps turn it off. Click on the DNA icon at the left under the zooming tool. A panel will open up on the right to turn the icon on and off. Sorry to hear you think the feature is worthless to you. Maybe once it is out of beta testing you can try again. Great! Now that is a LOT of matches to sort through—will you ever come up for air?? And I need to go see if that new tool you identified has anything of interest for me. Thanks, and great work! It may seem like a lot but I will only have to confirm one or two generations up from the matches since my full tree (private) is attached. For most, several generations from the MRCA down are in my tree. You’re welcome and thank you, Amy. You can attach a private tree? I didn’t realize that. Does it stay private? Amy, you can attach a private tree but it has to be searchable. Your tree remains private. As with all trees which are private but searchable on Ancestry it will show up in searches. Users cannot access it but they can get in touch with you. In ThruLines, it’s the same. Your private tree may be used to make a connection. 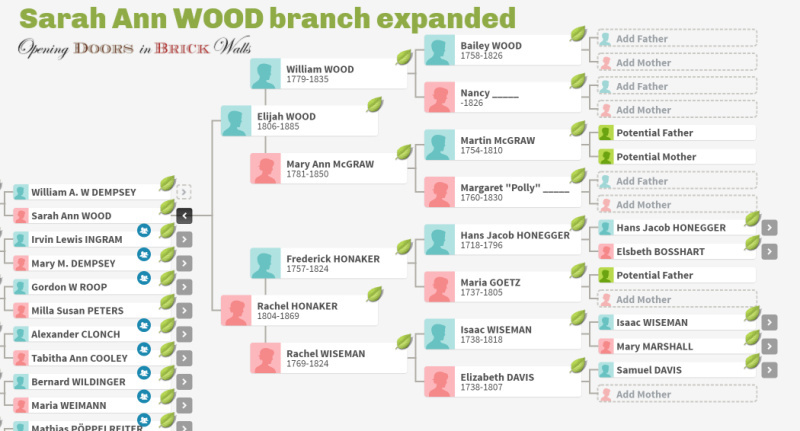 When the user clicks to view the tree it takes them to the contact page which includes the ancestor’s name if they are deceased and the year of birth and possibly place. One drawback: If you have given someone access to your DNA, they can view your ThruLines but if you are using a private tree they cannot see the names of the ancestors. They will see only cards with Private – no names or dates. You would have to give them access to your private tree so that they could see the ancestors’ names in your ThruLines. I’m glad to read you find my posts informative, Sharon. Thank you. I am thrilled to see that they fixed your Trulines. The Peters and PROFFITT lines are very important to me. Those are the family lines that I do most of my research on. Thank you so much for giving us your input on the Trulines experience. I need to do some work on the descendants of the PETERS and PROFFITT lines, mostly the second so that the ThruLines will be quicker to follow down to the matches. Your DNA kit on Gedmatch is very helpful to me as it helps sort out the matches we have in common. You’re welcome, Bonnie. Glad to hear that your issue has been resolved. When talking to Ancestry people at RootsTech, one man mentioned that they read all the comments made on their Facebook page. If talking to someone doesn’t help. perhpas a FB comment would do the trick? I’ve contacted Ancestry on their Facebook page by message and received quick replies. For one issue it took a while to get them to understand the problem and in the end they offered me a free month US sub. That was a year ago and I still haven’t used it. Good to know they read all comments. Thank you, Linda. How exciting Cathy. I hope and pray the Thru Lines can help with my 2 huge brick walls. I am also a frequent Feedback responder on all aspects of Ancestry’s website. Happy hunting. Over the years (I’ve been an Ancestry subscriber since 2002) I have often sent in correction on indexed records. But I have rarely given feedback other than answering surveys. Maybe as a long-time user I should give constructive feedback more often. Thank you, Diane. I hope the ThruLines will help you with your two brick walls.